I wrote in 2014 that a carbon tax could be introduced in Ontario's electricity sector without raising rates. that would prevent the sale, basically at the cost of fuel, from gas-fired generator which Ontarians pay the full cost of running (through the global adjustment). Last week was the highest net export week Ontario has experienced, averaging 2,865 megawatts each fetching around $20, which is 2 cents/kWh (weeks start on Wednesdays - presumably because the market opened May 1, 2002 - a Wednesday). The record replaced the previous week's record hourly average of 2,827 megawatts, which was essentially given away at no cost. One difference between the two weeks is that the natural gas generators Ontario contracted with Net Revenue Requirement contracts over the past decade were used much more in the recent week - which brings me back to taxing them. I realize this is difficult to follow, but I offer this incentive to try: if you are paying electricity rates in Ontario you are paying high rates while providing Americans cheap power. Net Revenue Requirement contracts were made to attract suppliers of electricity generated from natural gas to Ontario because nobody in their right mind would build a merchant plant in the province a decade ago - and today. I've written on this a number of places but basically average the estimated contract costs at ~$170,000 per megawatt of capacity, per year. The expectation is that revenue guarantee is paid for by Ontario ratepayers through the global adjustment charge; if the generators were to bid into the market at a price that made money, the profit would mainly benefit Ontario's ratepayers. 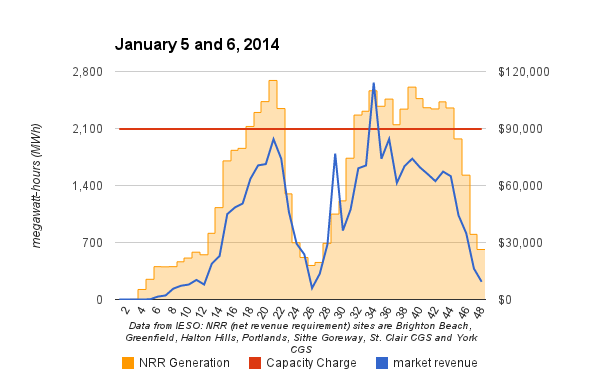 Here's an hourly graphing of output from the NRR generators over the first 48 hours of this cold work week, including the revenue recovered if sold at the Hourly Ontario Energy Price (HOEP), and the estimated cost Ontarians pay for the plants each and every hour. Mostly the "market revenue" will be paying for the fuel used for generation, but even if fuel was free there is only one hour where market revenues during these cold, high demand, days would pay what has been guaranteed the operators. So who does the generation benefit? 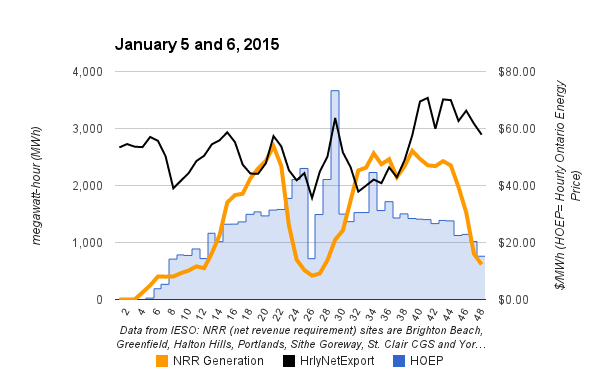 Ontarians might be surprised to know usually we are net exporters of more generation than these units provide. Ontario's system operator does nothing to attempt to recover the cost of the net revenue requirements from the market, making the production very attractive to foreign markets. To the masters of captive Ontario ratepayers the claim must be that nobody loses - Ontarians are on the hook for the NRR regardless - but I don't think anybody has ever given the ratepayers the choice between not being suckers and being suckers. Which is what they are - and few of them need to go into this level of detail to know that.